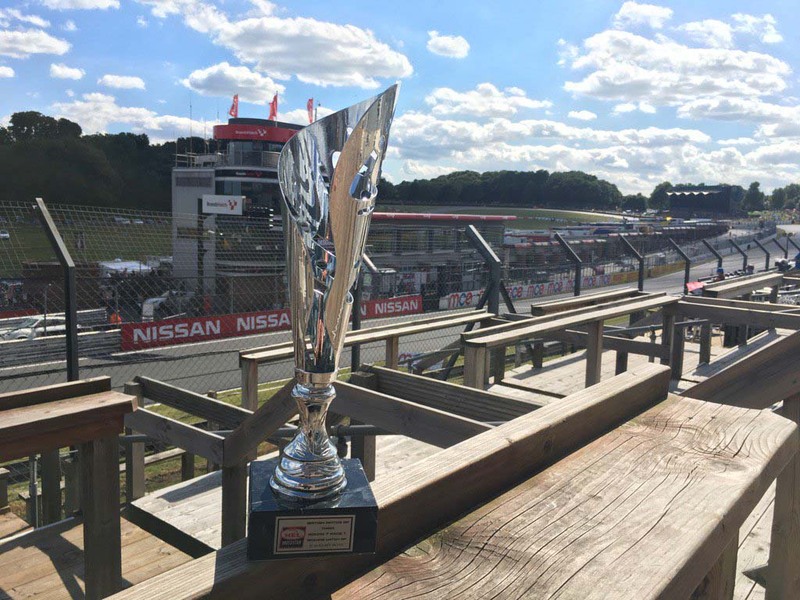 We travelled to Brands Hatch with one thing in mind, podiums! Jake Archer didn’t disappoint as he rode the RS racing, FTR, KTM to a Brands Hatch Brace for Team City Lifting Team City Lifting rider Jake Archer and his team made their way across the South of England on Thursday and settled in, nice and early, for the coming weekends events. Motorhome in place, awning up and resplendent with City Lifting flags, the team had marked out their patch for this latest assault on the HEL Championship. Team City Lifting were in a positive mood after their DNF at Thruxton. Ryan Saxelby and the team had done the necessary work to fit the MOTO3 KTM with a new engine and set up the bike ready for Jake’s next challenge. All that remained was to go out there and grab some more championship points! Brands GP Free Practice. You might of thought Jake would of rolled it back a little to test out the new engine but Jake was straight on the pace at the top of the time sheet. His first lap produced the 4th fastest time and he continued to lift his lap times throughout the session. As the riders tweaked their setup and got their eye in on the famous Brands GP track, lap times increased and a see saw battle ensued at the top of the leader board. Jake moved from 4th to 3rd and back again before pitting with 15 minutes of the session remaining. But where was Charlie Nesbitt? A glance at the time sheet saw Nesbitt languishing in 25th, we later learnt that Nesbitt had also changed the engine in the former Valentino Rossi Redline KTM and he was taking his time to run in the new engine in the first half of the session. With 10 minutes to go, Jake was down to 5th, only 0.656 off the leader Ed Rendell but on the very next lap, Jake turned the screw! Posting his first quick lap of the session, Jake hoisted himself up into 2nd position just 0.099 off of top spot. Nesbitt meanwhile was quietly going about his work, moving up to 13th. It was Josh Owens who was next to strike, pushing Jake into third but the Andover rider was in no mood to give away his place and snatched it back on the very next lap. So, with 5 minutes to go it was Owens from Archer with Rendell and Best rounding out the top 4. No doubt to the delight of the 4 leaders, Nesbitt was still 2.25 seconds off the pace but at the top of the time sheet it was Ed Rendell who had forced his way into the top two, pushing Jake down into 3rd again. On the last lap of the session there was yet more drama as Nesbitt surprised everyone with a lap of 1:36.741 which lifted him into third and once again squeezed Jake out of the top 3. The second session on Friday ran pretty much the same as the one that had gone before, but with one notable exception, Nesbitt was straight to the top of the time sheet and that’s where he stayed. Jake was determined to do something to upset what was now becoming the status quo and fought back to within 0.689 of Nesbitt, at one point going second fastest to show that the FTR KTM does have the pace to keep up with the Championship leader. As the session wore on, Josh Owens and Ed Rendell started to post their own quick times, moving in front of Jake as they battle for second and third. Jake again went 3rd, only to be beaten back on the next lap. 15 minutes into the session Jake took the City Lifting machine back to the pits for a scheduled pit stop, returning to the track after minor adjustments had been made to the setup, Jake took a couple of laps to warm up before once again throwing down the gauntlet with a time of 1:35.791 moving him back up to second position. Jake comfortably held on to second until the last two laps but it wasn’t to last! Owens, Rendell and Archer all went faster on the final lap and by the time the dust had settled and everyone was however across the line it was Nesbitt, Owens, Rendell and Archer in that order. Saturday morning and it was an early start for Jake Archer and Team City Lifting. With the HEL Performance race first up, it was going to be interesting to see who would adapt quickest to the cooler track conditions. Jake got off to a decent start, holding his position, and true to the form he had shown on the previous two outings, it was Jake who made 4th place his own. However, Jake’s times were improving and he crept back to within just 1.661 off the lead. Jake held on to his 4th position but it was clear that after 10 minutes of trying, some further adjustments were needed and the City Lifting, RS Racing, FTR, KTM was bought back to the pits. 3 minutes later Jake was out on track again but on the very next lap a new name had forced it’s way into contention, young Spaniard Dani Saez had taken advantage to move into 4th, leaving Jake in 5th for the first time this weekend. While all this was going on, Nesbitt was busily putting a couple of second into the rest of the field with his fastest time of the weekend so far. Jake on the other hand was back to the pits with 7 minutes of the session to go and returned to the track just 2 minutes later, determined to fight his way back into contention. The last two laps saw Nesbitt and Owens running first and second with Saez, Archer, Slooten and Rendell vying for third place but it was eventually Saez who claimed third with Jake once again picking up 4th place. Starting from the now ubiquitous 4th place, Jake got a decent start and swept into the first corner to hold his 4th position in this 10 lap sprint race. As the race at the front started to sort itself out the competition for places was so fierce that Jake was forced back to 8th by the time they took Druids. Eugene Mcmanus Jr was having the ride of his life in second and Nesbitt had already gapped the field to leave the rest of the pack to fight it out for themselves. Jake meanwhile was battling hard and by the half way point of the first lap he had pulled back one place to move into 7th, this is where Jake would stay and by the third lap, the race had started to stretch out. It was Nesbitt out in front , then a gap to the next two riders with a further gap to the next group of three and Jake leading a 4th group of five riders who were following close behind. Up ahead, Richard Kerr’s group had been caught by the third group on the road containing Eugene McManus and the race was beginning to come back as the riders ahead slowed one another down battling for position. As they started lap five McManus ran wide, onto the gravel, managing to keep his bike upright, before sadly, tumbling out of the race. Jake was showing his experience, letting other riders get in each others way and make their own mistakes before starting his fightback. Lap 6 and 7 went past in a blur as Jake moved up into third from nowhere. This is how it stayed until lap 9 when Richard Kerr moved ahead of Jake but Jake nicked the place back just 2 corners later. Dani Saez in 5th was having a go at Kerr as they came into the last lap and the pressure proved too much for Kerr as he lost his front wheel and slid off into the gravel. The rest of the lap was a formality and Jake rode away from Saez to clinch a satisfying 3rd place with calm and measured display. Sunday morning got underway with a 10 minute warm up. Here we saw Jake once again moving between 3rd and 4th position before finally settling matters with a lap of 1:35.291 that clinched third for Team City Lifting. Anticipation built throughout the afternoon as we witnessed some fantastic racing from Brands Hatch. No doubt buoyed by some of the heroics seen in some of the previous races, the HEL Motostar riders lined up for the final time in this 14 lap feature race. Jake starting from the front row got a slow start and was passed by Richard Kerr who rode straight through the middle, closely followed be a flying Eugene McManus Jr. Jake was running 5th through the first few corners but it was a more frantic race situation that that we had seen in the previous race. The battle at the front saw McManus take a hideous high side early on, ending his race prematurely for the second time of the weekend. Fortunately, Eugene walked away relatively unscathed. Lap 2 and Jake was running 6th but Ed Rendell ran wide leaving Jake to move into 5th position, this is how it stayed into lap 3 with Nesbitt out in front with a large gap back to the chasing group of three riders and Jake following closely behind. Half way through the lap and Jake and Ed Rendell had closed the gap to the three men in front. So it was Kerr, Saez and Archer battling for third place and as they approached Dingle Dell on lap four Jake lined up a beautiful move to relieve Richard Kerr of his 4th place. Lap five gets underway and out in front it’s Nesbitt with a 3 and a half second lead, Josh Owens is next on the road with a lead of around 1 second and then we have a line of 5 riders headed by Dani Saez. That’s how it remained until lap 6 when Jake moved ahead of Dani Saez to put one foot on the podium. Jake was now pushing on, putting in some of his fastest laps of the race and drawing to within 1.789 of Owens in second place. By lap 10 however Owens had re-asserted his lead and moved to 2.241 seconds ahead. As we drew towards the end of the race, Jake seemed to be riding within himself but the gap to the next man on the road was a comfortable 5.322 seconds and he crossed the line on the 14th lap with plenty to spare. Jake Archer produces a mature display of race craft to ride himself into a 31 point lead over his nearest rival in the Championship, Ed Rendell and produce a stunning Brands Hatch Brace for Team City lifting.